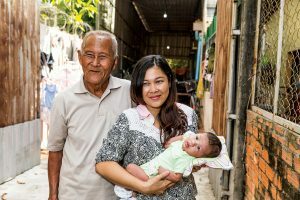 The Cambodian Oral History Project connects generations—like Him Hen, his daughter Him Sophia, and his grandchild—by documenting the stories of elders, including tales of life under the Khmer Rouge. Photo courtesy of Cambodia Oral History Project. Sitting in the living room on stacked rice bags, Khem Srey’s grandchildren hear her life stories for the first time, thanks to a project that began at BYU. “A lot of the younger people don’t know anything about their Cambodian family history,” says Dana S. Bourgerie, a BYU professor of Chinese. In 2016 he launched the BYU Cambodian Oral History Project to begin collecting stories. The project invites Cambodian Latter-day Saint youth to record and transcribe interviews with their extended family members and send them to BYU for translation and archiving. Some histories are hard to retell. Many elderly Cambodians are hesitant to relive the horrific period during the 1970s when the country was ruled by the Khmer Rouge, a radical agrarian Marxist group that killed between 1 and 2 million people, targeting the skilled and educated. Stories like this are alarmingly common, says Bourgerie, but important to share. To launch the project, BYU research students flew to Cambodia to teach interviewing and tech skills to youth and Church leaders. While only 40 interviews were gathered the first six months, anonymous donors, a BYU ORCA grant, and fortuitous encounters with helpful Cambodians propelled the project forward. Bourgerie’s team now receives hundreds of interviews each month. Not all the stories are sad—some show how life carried on despite the occupation: one couple met through a misplaced phone call; another man stole shoes from a guard so his wife could wear them on their wedding day. A young man in a refugee camp stayed in shape by teaching himself to climb coconut trees. As these stories are similarly dug up and given new life, nearly 3,000 interviews have now been collected in the BYU project database. It’s the largest collection of Cambodian histories in the world by far, according to Bourgerie. The wealth of stories is beginning to be accessed by researchers at BYU and other universities studying Asian history, trauma impact, folklore, and variation between Khmer dialects. The database is also a timely genealogical resource given the recent announcement of the Church’s plans to build a temple in Phnom Penh. Research intern and BYU master’s student Theary Leng (’20) grew up in Cambodia and says the project’s purpose is not just to document the atrocities of the Khmer Rouge but to capture stories about loved ones. “The more stories you know about them, the more you’re closer to them,” she says. So far, only a dozen of the 3,000 interviews have been translated. Volunteer to help with Cambodian, Chinese, and Vietnamese translation. Great stories can inspire us, make us better, and help us make good decisions.